Home » Blog » We did it! Today, the winter campaign totals are confirmed and we are blown away by your support. That’s right, we raised over $179,127! In November we set out to raise $167,000 by the end of the year, which means you surpassed our goal by over $12,000! I joined the fundraising team three months ago. So, when I tell you that we beat our winter campaign goal, I am truly amazed by every single person who participated. The way people showed up for the Community Cycling Center inspires and motivates me. The Bicycle Ball was my first event. I got to see how generously you donate and how hard you party! Raising over $4,200 in a night, we kicked off the campaign right. During our live podcast, Breaking the Grid, we teamed up with Oregon Walks and BikePortland.org to engage new and long-term supporters in a talk about the future of transportation. 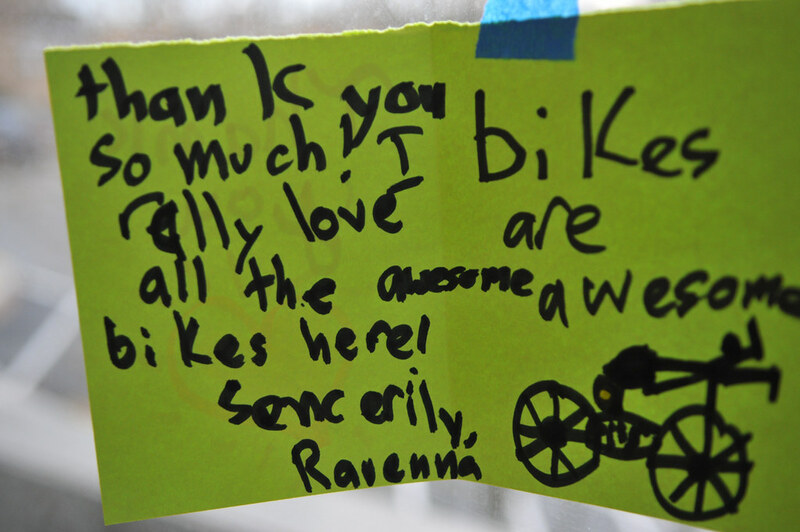 Of course, we had an amazing Holiday Bike Drive where over 270 of you showed up to help send 300 kids home with bikes! This doesn’t even include the volunterers that showed up every Tuesday night, dedicating over 5,000 hours to ensure those 300 bikes were ready-to-ride! Plus, we kicked off our 1,000 bike challenge with our awesome partners, Salt & Straw; for every $50 you donated for a kid’s bike at Salt & Straw, they doubled it! Salt & Straw also donated $25 for every gift pack bought by a Nike employee. Giving comes in many forms. While some of you ate ice cream, others gave online, built a bike, sent in mail, and attended a fundraising event. The point is, you all made it happen and we appreciate every single one of you. With the full support of a successful year-end campaign, we’re really excited to dive into our programs for 2016. The first program we have planned in the new year is our pilot program teaching Science curriculum using the bicycle at Helensview School and Rosemary Anderson High School. As the temperatures warm up in the spring, we’ll be teaching Bike Club at three middle schools in Portland, giving 40 youth the opportunity to earn a bike and learn safe riding and decision-making skills. Once the summer riding season truly kicks off, we’ll of course have our summer Bike Camps (registration begins February 2nd! ), weekly open hours at the Bike Repair Hub in New Columbia, and a full season of rides and events with ABC in Cully. And expect us to provide even more bikes to kids at Holiday Bike Drive and other earn-a-bike programs in the new year. A very special thanks to our winter campaign lead sponsor, Lam Research Foundation. We couldn’t have done it without our amazing business partners: Kristin Lensen Consulting, Salt & Straw, Asean Corporation/Stalkmarket, Nossa Familia Coffee, Simple and North St Bags. These great local businesses kept our volunteers & supporters fueled during our events: Russell Street BBQ, New Seasons Market, Cash & Carry, Hopworks Urban Brewery, St Honore, Great Harvest Bakery, Alberta Street Co-op, Sunrise Bagels, and Grand Central Bakery. Thanks to the generous employees of Lumberyard PDX, Graincorp Malt and Hotel Monaco, who not only donated but also put their hands to work building bicycles for children at Holiday Bike Drive. Northwest Health Foundation, Harbor Oaks Foundation, and Metro Regional Travel Options generously sponsored our Holiday Bike Drive.